I have done quite a bit of research into finding a good and cheap radio controlled clock. Initially i did it to be able to strip out the decoding chip from the PCB and find out how this works. They all use a special decoder chip called the HKW581 developed by HKW. This chip takes the information from the receiver and decodes it so that it is possible to translate to human readible form. Eventually i found a source of the chip the HKW581. You can also buy them directly from the webshop. If you have come here to look for a ready made clock then the best value for money one i could find is from TFA 35.1080. The unit costs only 34.95€ plus postage but unfortunately it is now no longer made. forecast is shown on the display. This gives you a quick overview of the weather situation for the following days at any time. Updating the weather data is done every day. 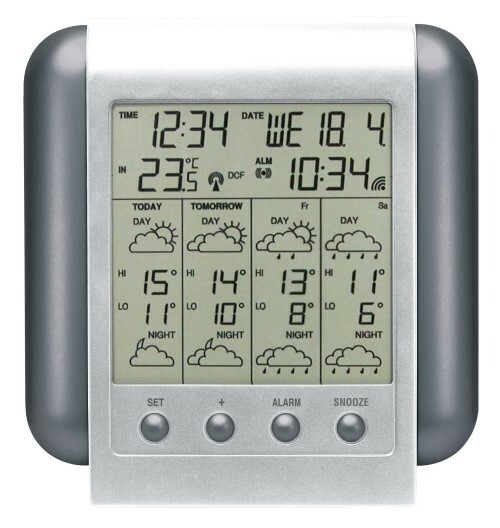 This weather station allows the reception of weather data of the private provider Meteotime via DCF signal without time limit and additional costs. Meteotime is responsible for the dispatch and the correctness of the transmitted data. – There is selection possibility for 12 languanges.